Chorgram is a tool implementing the theory introduced in From Communicating Machines to Graphical Choreographies (J. Lange, E. Tuosto, and N. Yoshida, POPL 2015). This branch is also based on An abstract semantics of the global view of choreographies (R. Guanciale and E. Tuosto, ICE 2016) and its journal version Semantics of global view of choreographies (J. Log. Algebr. Meth. Program. 95: 17-40, 2018; available here), and in Reversible Choreographies via Monitoring in Erlang (A. Francalanza, C. A. Mezzina, and E. Tuosto, DAIS 2018). A tutorial is also in chapter 6 of Behavioural Types: from Theory to Tools ( a book published by River Publishers. Although many features are stable, a few are still work in progress (and new variants are often attempted on stable features too). sgg: takes in input a description of a global graph (with an extended syntax), projects the graph in a set of (non-minimal) CFSM provided that the graph is well-branched and well-sequentiased (this check can be disabled with --sloppy option). Chorgram is a polished and extended version of gmc-synthesis and of gmc-synthesis-v0.2; those old versions are deprecated. The syntax of the input files of gmc can be either in the 'fsa' (after finite state automata) or 'cms' format, the latter being the simple process-algebraic syntax described below. Which format is used depends on the extesion to the file name ('.fsa' or '.cms' respectively). specifies a system of two machines. - machine 0 is named A (line '.outputs A'), has q0 as initial state (line .marking q0) from which it may send either a message 'hello' or a message 'world' to machine 1 and move to state q1 (lines 'q0 1 ! hello q1' and 'q0 1 ! world q1', respectively). Messages can be any sort for string; the current implementation does not interpret them, but in the future we plan to fix a syntax and a semantics in order to deal with e.g., variables, binderds, values, etc. - machine 1 is ready to receive either message sent by machine 0. Machine names are optional (e.g., machine 1 is anonymous in the example above); if present in the input file, they are used to denote the channels in the files generated by the tool (for instance, the first transition of A is displayed as "AB ! hello" rather than "01!hello". Lines '.outputs ...', '.state graph', '.marking ...', and '.end' are mandatory. Lines starting with '--' are ignored. Text surrounded by square brackets or between '..' and a newline is treated as comment. A system S is given a name, specifies the (comma-separated list of the) names Ptps of its machines, and has a declaration Mdec for each machine. Each name in Ptps must have a unique defining equation Ptp = M where the syntax of M is straightforward. Transition are similar those of the 'fsa' format, but they use explicit names rather than positions to address machines. Moreover, it is possible to specify internal transitions 'tau' which also carry an uninterpred annotating string. Note that branches and forks have to be surrounded by round brackets (this constraint will be relaxed in the future). The only syntactic check made (right now) during the parsing are (i) that sender and receiver of interactions have to be different, (ii) that defining equations are unique, (iii) that communication actions name existing machines, and (iv) a machine cannot be defined as its own dual. Error messages give some information, but should be improved. Text enclosed in '[' and ']' is treated as comment. which shuffles the syntax presented in the various papers and extends it with some syntactic sugar. The empty graph '(o)' has a special role: it is the empty graph outside loops, while in loops it marks a point where the selector may exit the iteration. Guards are used only for the reversible semantics and the string in them is supposed to be some valid erlang code. Likewise for the sel construct, which generalises the choice for the reversible semantics. Notice that the sel and the branch constructs have the same semantics and require to specify the selector of the branch (to make it simple the realisation of projections on Erlang; the selector is mandatory for REGs and optional otherwise). The clause 'unless guard' is optional in branching and iteration. The binary operators |, +, and ; are given in ascending order of precedence. Text enclosed by '[' and ']' and is treated as comment and, after '..', so is the rest of a line. 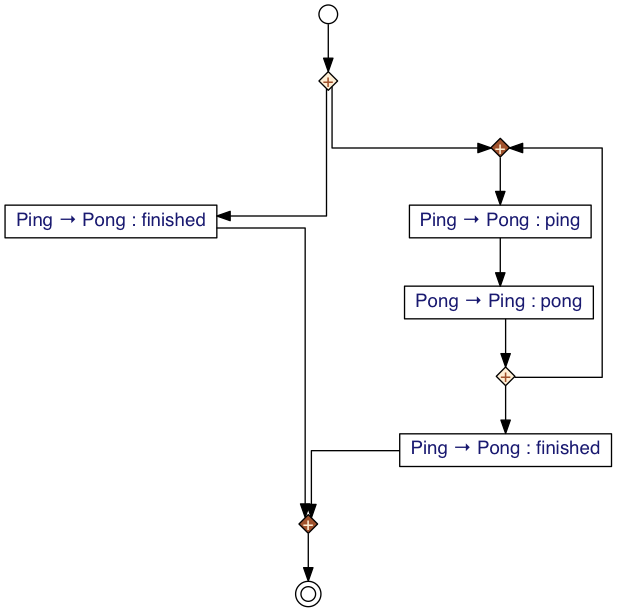 Basic syntactic checks are made during the parsing (e.g, (i) that sender and receiver of interactions have to be different and (2) that the participant controlling a loop is active in the loop). More are planned together with some more informative error messages. (recall that ';' has priority over '+'). At the moment choregram is available for linux-like architectures only. So far, chorgram has been tested on Ubuntu 13.04, 14.04, 16.04 and Mac OS X (v10.9). The following tools and libraries are required. do not insert text before the very first line. Move the directories of HKC and Petrify in under the directory chorgram. Any subdirectory would do, but we advise to put them under 'aux'. if you want, you can compile HKC yourself by going into the directory of HKC and typing make (you will need OCaml, ./hknt-1.0/README). The important files are 1, 4, 5, 10, 19, and 20 which respectively are the global graph in pdf format (1), the CFSM machines in dot (4) and pdf (5) format, the global graph in dot format (10), and the transition system in dot (19) and pdf format (20). 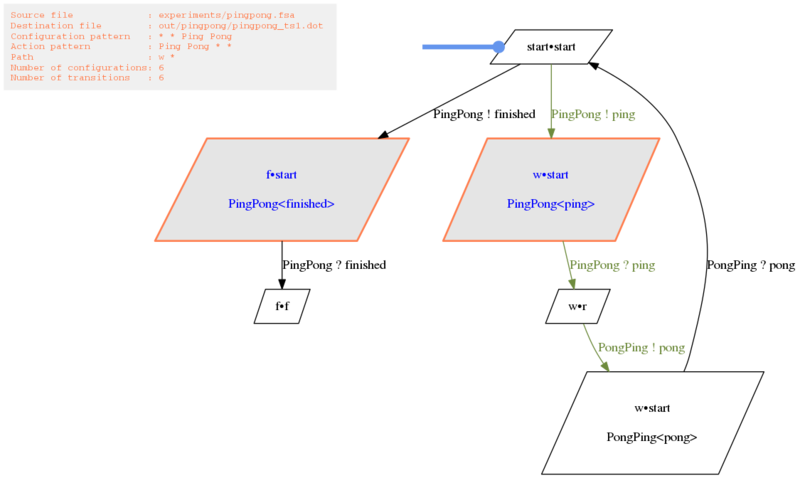 this example is meant just to show how to specify conditions on nodes and transitions using the options -p, -ts, and -cp and how to use dot options --dot (the parallelogram shape is what makes the diagram look bad). A better way to set dot preferences is to edit the file .dot.cfg described above.